Despite the excitement over Russia’s conquest of Crimea, continuing strife in Syria, and increasing instability in Egypt, world oil prices remain stable for now, with Brent futures near $105. Canadian oil sands plus North American shale oil & gas have combined with Gulf of Mexico oil & gas to provide new supplies and reduce US demand on the global markets. This reduced global demand is creating an incidental “surplus production” in a number of areas such as Africa, which helps to calm the always-frayed nerves of international oil traders and analysts. Some analysts are so relaxed that they are predicting a drop in oil prices as low as around $75 bbl. US energy prices are far lower than those in Europe and Japan, and this fact – together with rising wages in China and the increasing productivity of US factories – means a number of US firms are looking to bring production back home – a process known as reshoring. Several companies, including Dow Chemical, General Electric, Ford, BASF and Caterpillar, have announced hundreds of millions of dollars of investment, either in new plants or in re-opening shutdown facilities. Even Apple has announced a new factory in Arizona more than a decade after closing its last US plant. In fact, between 2010 and the end of March 2013, almost 100 chemical industry projects valued at around $72bn were announced, according to the American Chemistry Council. 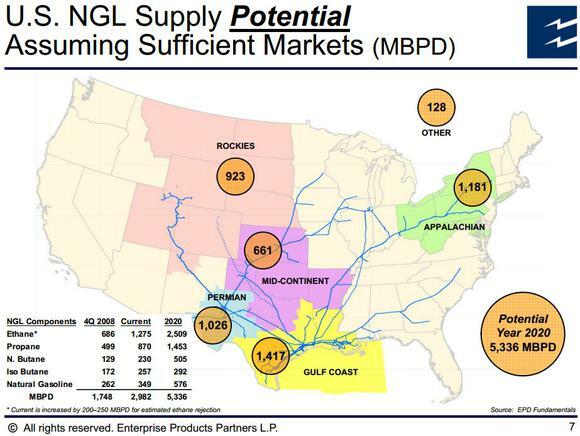 Fortunately, Obama’s EPA was too busy killing US coal to understand how big a deal US shale oil & gas was becoming. The EPA appears to be withholding damaging new regulations against shale oil & gas until after the 2016 presidential elections. …The explosion in NGL production has opened up the opportunity for companies including Enterprise Products Partners to export our growing supply of propane. Last year, the United States shipped out 112 million barrels of propane to become the world’s top exporter of the material. Enterprise led the way in exporting 87 million barrels in 2013. Through all the instability in Syria, Egypt, and Crimea, analysts expect Russian oil to continue flowing at current high levels. Among other things,Russia is having problems with Gazprom, which will tighten government funding a bit. And capital flight out of Russia could increase to $150 bn this year due to internal economic and political concerns. So it is important for Russia’s government that Russian oil continues flowing, whether oil prices remain stable, or should they drop 10% to 20%. China is implementing a new round of stimulus geared to keep its massive ghost-bubble economy running. This should keep China’s appetite for global commodity imports at least semi-healthy, for now. In the longer run, we know what eventually happens to bubble economies, particularly those incorporating a large ghost sector. India’s economic growth has slowed, and could go either way in the future. Levels of corruption inside all levels of Indian government rival those seen inside Russia, making conducting business very difficult and expensive. All stimulus aside, this should be reflected in a slowing growth in demand for global commodities including oil. Demand for oil across much of the third world is dependent upon outside monetary aide and medical assistance — without which most third world demand would collapse, along with third world populations. In the Anglosphere, Australia, Canada, and the US are becoming energy powers. The UK has the potential to expand its energy production, if not for its close ties to the dysfunctional EU, and its own homegrown green dieoff.orgiasts. Europe, unfortunately, is in the death-grip of unelected EU bureaucrats and national greens. Somehow Europe imagined that it could magically leap into a post-carbon world without a massive increase in use of nuclear power. Windmills and solar panels are intermittent unreliable sources of energy and cannot be counted on in a crunch. Europe has begun to pay the price for its green idiocy, and the payments are likely to continue for a long, long time. This entry was posted in Energy and tagged Peak oil, Shale Boom. Bookmark the permalink. All this new and cheap energy is a great boon to our country. Thanks to fracking and better methods of finding and extracting resources we can have all the benefits of cheaper energy. But no worries, I am confident that our politicians will find some way to give away or destroy this great gift and retain our high unemployment rates and decreasing middle class.